5.4 Earthquake hits Jilin, China. 5.2 Earthquake hits Sumba region, Indonesia. Typhoon Krosa is approaching the northern Philippines with its heavy rain and flood/mudslide threat and strong, gusty winds. Still looks like a track thereafter toward a position over or near Hainan Island of extreme southern China. Raymond is finally done but mid-upper level moisture from what’s left of it continues flowing into the system affecting the central U.S.
A new system is organising southeast of Raymond’s remnants and could become a tropical depression or storm during the next few days and eventually head toward Mexico rather than out to sea … or at least be another system to send some moisture northeastward, a little of which is already happening. 5.8 Earthquake hits offshore Maule, Chile. 5.6 Earthquake hits offshore Maule, Chile. 5.1 Earthquake hits Eastern Russia – North-eastern China border region. Tropical depression Krosa is located approximately 585 nm east of Manila, Philippines. Tropical depression Krosa is forecast to strike the Philippines as a tropical storm at about 03:00 GMT on 31 October. Tropical storm Raymond is located about 530 mi (850 km) SW of the southern tip of Baja California. Three people were killed and at least 12 injured after a dust storm led to multiple crashes Tuesday on Interstate 10 between Phoenix and Tucson. Heavy showers, flash floods hit eastern Singapore. Fresh floods wreak havoc in coastal West Bengal, India. A warm spell in Moscow broke a record on tuesday as temperatures climbed to 14.9 degrees celsius – the highest since 1895. Until tuesday, the highest temperature ever recorded on october 29 was 14.8 degrees. Unusually high temperatures hit Moscow this week, exceeding the norm by 5-8 degrees. Cooler weather is expected by the weekend, with highs around 7-12 degrees, but that is also above average. This year’s fall weather had already broken records, with September getting three times the average amount of rainfall, more than ever recorded in 130 years of record-keeping. Trailer Truck-Size Asteroid buzzed Earth inside Moon’s orbit Tuesday. A space rock the size of a tractor-trailer flew harmlessly by Earth (Oct. 29), zipping between our planet and the moon. WHO has been informed of an additional laboratory-confirmed case of Middle East respiratory syndrome coronavirus (MERS-CoV) infection in Qatar. A new eruption started this week at the Zhupanovsky volcano, about 70 km northeast of the capital of Kamchatka, Petropavlovsk-Kamchatsky. 6.0 Earthquake hits the Balleny Islands region. Tropical storm Raymond is located about 645 mi (1035 km) SW of the southern tip of Baja California. Raymond is quickly weakening. Hurricane-strength wind gusts, waves up to 25 feet high, and driving rains are battering northern Europe. As of 2 am local time Monday, the peak wind gust from the storm in the UK was 92 mph, at the Isle of Wight in the English Channel. Powerful winds have also swept the north coast of France; winds in Brest, France hit 41 mph, gusting to 67 mph at 2 am local time Monday, and gusted as high as 65 mph at Caen. With the trees still in leaf, winds this strong have the potential to cause heavy tree damage and large scale power outages. Emergency services in Denmark and Sweden have issued storm warnings, as Scandinavia faces winds gusting at about 100mph (162km/h). 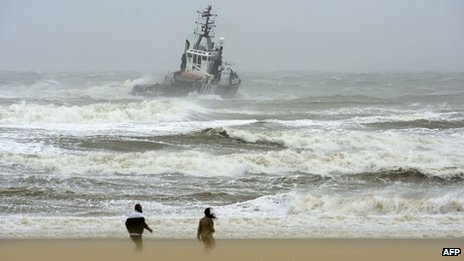 The storm system deepened as it crossed the North Sea. One site in eastern Denmark, Kegnaes, reported a gust of 115mph mid-afternoon. Along Germany’s North Sea coast many ferries were confined to port and shipping on the Elbe was also disrupted. Thirteen people have dies as the storm crosses north-western Europe – six were killed in Germany. The major Atlantic storm packing hurricane-force winds pummelled England, France, Belgium and the Netherlands early Monday, knocking out power to 220,000 homes in England and blocking roads and railways with fallen trees. At least six people have been injured as wild weather hit New South Wales, Australia, Tuesday afternoon. Chile has been hit by the worst frost in 84 years, decimating the country’s fruit industry from Coquimbo to Bio-Bio. Following reports of a cluster of 22 acute flaccid paralysis (AFP) cases on 17 October 2013 in the Syrian Arab Republic, wild poliovirus type 1 (WPV1) has been isolated from ten of the cases under investigation. Final genetic sequencing results are pending to determine the origin of the isolated viruses. The five cases occurred in the geographic zone of la Huasteca, an area where urbanisation, availability of drinking water and basic sanitation services are limited. 5.1 Earthquake hits the Panama – Costa Rica border. Hurricane Raymond is located about 690 mi (1115 km) SW of the southern tip of Baja California. No threat to land. Southern Britain was battered Monday by a powerful storm with hurricane-force winds that caused widespread delays on the nation’s roads and trains, and threatened severe disruptions to airports. There are fears of an imminent outbreak of the deadly typhoid disease, following widespread incidences of dysentery in Harare’s densely populated suburbs where people are drinking water from unprotected sources. Health officials last week said perennial water shortages, coupled with discontinuation of water supplies to defaulters had forced residents to get water from unprotected sources, while the residents blame the city fathers for failing to supply running water for domestic purposes, forcing many of them to use water from unorthodox sources. For the week ending October 10, 14 deaths were recorded in one week and of that number, six were children under the age of five years. An infected person will pass on the bacteria in their stools when they go to the toilet, and can infect their surroundings and if it is a communal toilet, many will most likely get the disease.